Function First » Blog Archive » Neck pain from your eyes? Neck pain from your eyes? Chronic pain is complex, resulting from many inputs processed through the nervous system and the brain. As humans, we rely heavily on our vision to assess and navigate our environment and maintain balance. Visual references are also one type of input the brain relies on to determine a potential threat to the organism. For example, have you ever found a bruise on your body that did not hurt until you noticed it there? Harvie et al. (2015) investigated the role of visual feedback on neck pain. 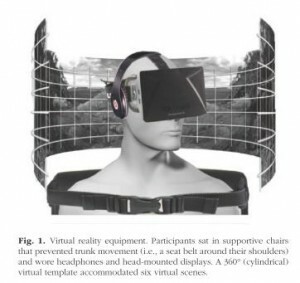 The researchers used a virtual-reality apparatus to alter the visual proprioceptive feedback that subjects received during cervical rotation. Subjects were seated with their torsos fixed to avoid contributing motion from the thoracic spine during cervical rotation. Twenty-four subjects with chronic neck pain were assessed for the onset of pain during cervical rotation to the left and right. They were asked to stop when they felt pain and to rate it on a scale of 0-10 at the point in the rotation where pain occurred. Each subject was then fitted with a virtual-reality headset that provided six different visual scenes for six trials. The image below is taken directly from the study by Harvie et al. (2015) and shows an illustration of the set up. This bogus visual feedback of plus or minus 20% made the subjects perceive that they were rotating their cervical spines 20% more or less than they actually were. This study provides additional evidence to support the findings that pain is not generated solely from tissue damage. The bio-pyscho-social model acknowledges multiple inputs contributing to the pain experience. Vision is one of many contributing inputs that the brain processes when assessing a threat to the body and therefore produces pain. The association of a specific neck range of motion identified visually, coupled with information from the motor system and proprioceptive system, creates a confirmed reference for past pain experiences. In other words, we’ve always had pain with this set of circumstances (neuro signature of matched proprioception, motor function, vision, vestibular), so we are supposed to have now. Hello pain. It is plausible that visual input can also influence pain in other areas. For example, if a client has lower-back pain, forward flexion of the spine will bring her eyes closer to the floor, possibly presenting a painful or pain-free experience, depending on the client. When designing a corrective program for clients where you believe the visual field is a factor, you could vary the visual field to minimize the visual association related to painful movements. Or you could keep the head still and create the motion you want from the bottom up-creating relative movement of the cervical spine in relation to the thoracic spine. Interested in learning more about how we, at Function First and the Pain-Free Movement Specialists work with the chronic pain population? Enrollment is available only until April 29th here. Melzack, R. 2001. Pain and the neuromatrix in the brain. Journal of Dental Education 65(12), 1378-82. This entry was posted on Wednesday, April 27th, 2016 at 11:11 pm and is filed under General public, Health and fitness professionals. You can follow any responses to this entry through the RSS 2.0 feed. You can leave a response, or trackback from your own site. correct posture training initiatives, awareness and application in all our activities.